We aim at understanding how physical forces and molecular control modules cooperate to drive biological function. 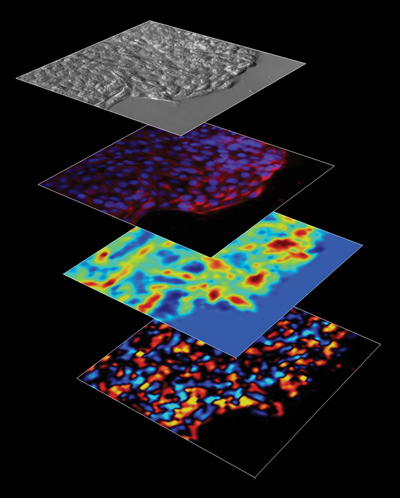 We develop new technologies to map and perturb the main physical properties that determine how cells and tissues grow, move, invade and remodel. By combining this physical information with systematic molecular perturbations and computational models we explore the principles that govern the interplay between chemical and physical cues in living tissues. We study how these principles are regulated in physiology and development, and how they are derailed in cancer and aging. A group of human mammary epithelial cells expands asymmetrically on a surface of increasing rigidity (towards the right of the image). Colored lines correspond to the tracks followed by each cell (gray dots) for 10h. To study cell and tissue dynamics we develop new technologies to measure physical forces at the cell-cell and cell-matrix interface. By combining these technologies with computational analysis of cell shape and velocity we obtain a full experimental characterization of epithelial dynamics during tissue growth, wound healing and cancer cell invasion. Cancer cell invasion and metastasis remain the leading cause of death in patients with cancer. Both processes are the result of a complex interaction between tumor cells and their microenvironment. One of our main lines of research is to study how tumours exploit the functions non-cancer cells in their microenvironment to invade and metasize. We focus on the interaction between epithelial cancer cells and Cancer Associated Fibroblasts (CAFs), the most abundant cell type in the tumour stroma. In a recent study we were able to demonstrate that CAFs guide the collective invasion of cancer cells through a physical force. This force enables CAFs to physically drag cancer cells into the surrounding tissue. Force transmission is mediated by a heterotypic interaction between two different proteins, one located on the surface of cancer cells called E-cadherin, and another expressed on the surface of fibroblasts, called N-cadherin. The recent development of optogenetic technologies offers promising possibilities to control signalling pathways with high spatiotemporal resolution. By expressing genetically encoded light-sensitive proteins, optogenetic technology enables the reversible perturbation of intracellular biochemistry with subcellular resolution. We have developed optogenetic tools based on controlling the activity of endogenous RhoA to upregulate or downregulate cell contractility. We have shown that these tools enable rapid, local and reversible changes in traction forces, cell–cell forces, and tissue compaction. We have shown, further, that changes in cellular forces are paralleled by translocation of the transcriptional regulator YAP, indicating that our tools can be used to control mechanotransductory pathways. Our lab has developed techniques to simultaneously map cell velocities, cytoskeletal structure, intercellular stresses, and cell-substrate tractions (from top to bottom). Directed cell migration is one of the earliest observations in cell biology, dating back to the late XIX century. Also known as taxis, directed cell migration has been commonly associated with chemotaxis, i.e. the ability of a broad variety of cell types to migrate following gradients of chemical factors. We recently demonstrated a new mode of collective cell guidance by mechanical cues, called collective durotaxis. This new migration mode emerges only in cell collectives and, strikingly, does not require isolated cells to exhibit gradient sensing. 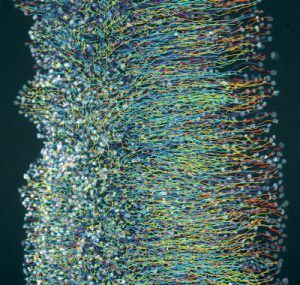 To study the mechanisms behind this phenomenon, we developed new tools to measure the forces that propel cells during durotaxis at the cell-matrix and cell-cell levels. Upon combining this new experimental technique with biochemical approaches and theoretical modelling, we concluded that collective durotaxis originates from long-range transmission of contractile intercellular forces. This mechanism is unique in that the very same machinery that senses the attractant -the actomyosin cytoskeleton- is responsible for propulsion towards it. As such, collective durotaxis appears to be the simplest and perhaps most primitive mechanism by which a collective system responds to a gradient. Using microfabrication technologies, we designed new ways to decipher the mechanisms of wound healing. By doing so we uncovered a new understanding of how cells move and work together to close a gap in a tissue. We showed that a new mechanism applies in which cells assemble supracellular contractile arcs that compress the tissue under the wound. By combining experiments and computational modeling, we showed that contractions arising from these arcs make the wound heal in a quicker and more robust way. Epithelial sheets must be malleable enough to adopt functional shapes during morphogenesis and to quickly self-repair after damage. Yet, they must be resilient enough to ensure organ compartmentalization and to protect organisms against environmental pathogens. To study the mechanisms that regulate this fine balance between malleability and integrity we develop tools to map epithelial tension during tissue stretching. By combining these tools with computational modeling we determined the mechanisms of epithelial fracture. Intriguingly, one of such mechanisms is hydraulic fracturing or “fracking”. Wednesday’s press release about the Nature paper published by IBEC and UPC researchers got a lot of press coverage. The embryonic stem cells that form faces – neural crest cells – use an unexpected mechanism to develop our facial features, according to a new UCL-led study involving IBEC researchers. IBEC group leader Xavier Trepat penned a short article for ARA magazine in which he discusses the research of Arthur Ashkin, Gérard Mourou and Donna Strickland, winners of the the Nobel Prize for Physics. Researchers from IBEC and UB have discovered that the way tumor cells expand defies the laws of physics. A review by IBEC group leader and ICREA research professor Xavier Trepat is one of six featured in Nature Physics’ latest ‘Insight’ issue, ‘The Physics of Living Systems’, in which all the articles have been co-authored by a physicist and a biologist. In a La Vanguardia feature by Josep Corbella, IBEC’s Xavier Trepat is interviewed along with IRB’s Salvador Aznar-Benitah about the important role music plays in their lives, how it has affected their careers as researchers, and about the relation and similarities between musical and scientific creativity. An article by IBEC researchers Pilar Rodríguez, Xavier Trepat and Raimon Sunyer about the importance of physical forces in understanding biological function appears in the June edition of Investigación y Ciencia, the Spanish-language version of Scientific American magazine. IBEC group leader and ICREA research professor Xavier Trepat has been elected as a Member of EMBO, the European Molecular Biology Organisation. IBEC is the recipient of one of twelve MIT-Spain ”la Caixa” Foundation Seed Fund grants under a brand new funding programme in collaboration with the Massachusetts Institute of Technology. The way cells find their way around is by ‘groping’ rather than seeing their surroundings: this is the main conclusion of a study published in Nature last week involving several IBEC groups and their collaborators. In their effort to shed light on the role that physical forces play in the body, Pere Roca-Cusachs’ group at IBEC has shown how these forces ‘switch on’ the expression of genes that may result in cancer. Researchers at the Institute for Bioengineering of Catalonia (IBEC) have observed, for the first time, mechanical waves that form after collisions between cellular tissues. A video produced by Fundación Banco Sabadell of Xavier Trepat, 2015 winner of the Banco Sabadell Award for Biomedical Research, appears on their YouTube channel. Three IBEC group leaders – Pere Roca-Cusachs, Vito Conte and Xavier Trepat – consolidate the institute’s leadership in mechanobiology by publishing a review of the field in Nature Cell Biology. IBEC has signed a Memorandum of Understanding with the EF Clif, the European Foundation for the Study of Chronic Liver Failure. In a study published today in Nature Cell Biology and supported by Obra Social “la Caixa”, researchers at IBEC have identified an interaction between two proteins that enables cancerous cells to use the physical forces of healthy cells to start tumor metastasis. Researchers at IBEC have controlled the contractility of a group of epithelial cells using an optogenetic switch activated by light. Xavier Trepat, ICREA professor and group leader at IBEC, was the guest star at the first anniversary celebration of Big Vang, La Vanguardia’s online science section. Researchers at IBEC and their collaborators at the Centre of Regenerative Medicine of Barcelona (CMR[B]) have developed a revolutionary new technique based on photoactivation (light activation), by which cells in deep tissue can activated and tracked in vivo without causing any damage. IBEC group leader and ICREA research professor Xavier Trepat has come third in the La Vanguardia Science Award. Scientists at the Institute for Bioengineering of Catalonia (IBEC) have revealed that, counter to previous understanding, the living cells in our bodies behave like solids rather than the liquids they are made of. A study by the Institute for Bioengineering of Catalonia (IBEC) reveals how cells withstand breakage during the constant changes in shape and volume experienced in most biological processes. IBEC group leader and ICREA research professor Xavier Trepat is this year’s winner of the Banc Sabadell Award for Biomedical Research for his work on understanding the fundamental biophysical mechanisms underlying cell interaction and communication. At a press conference at the Obra Social “la Caixa”’s Palau Macaya earlier today, Xavier Trepat, group leader at the Institute for Bioengineering of Catalonia (IBEC), Enric Banda, director of the department of Science and Environment of the Obra Social ”la Caixa”, and Josep Samitier, director of IBEC, described a study published in Nature Cell Biology which sheds new light on how to control metastasis. In an article published in the journal Nature Materials, researchers at the IBEC and the UPC describe their discovery that ‘fracking’takes place in the body at a cellular level. Researchers at IBEC reveal in a Nature Communications paper some surprising mechanics that drive epithelial gap closure in the absence of underlying layers. Xavier Serra Picamal, formerly a PhD student in IBEC’s Integrative Cell and Tissue Dynamics group, was awarded a prestigious Ramon Margalef Prize for the best paper derived from a doctoral thesis at a ceremony at the UB last night. Today’s news about the Integrative Cell and Tissue Dynamics group’s paper in Nature Physics has been covered in La Vanguardia. When we think of wound healing, we normally think of wounds to our skin. But wounds happen inside the body in all sorts of tissues and organs, and can have implications in many chronic diseases such as diabetes and asthma. Wounds also favour cancer progression by providing a physical and chemical environment that promotes the invasion of malignant cells. Now, a group at the Institute for Bioengineering of Catalonia (IBEC) has found a new way to decipher the mechanisms of wound healing, and by doing so has uncovered a new understanding of how cells move and work together to close a gap in a tissue. Integrative cell and tissue dynamics group leader Xavier Trepat is profiled in El Mundo’s ‘Innovadores’ supplement today. The news about Xavier Trepat’s Proof of Concept grant from the ERC appears in La Vanguardia today. This week’s press release about the Integrative Cell and Tissue Dynamics group’s work published in Nature Materials has appeared online in La Vanguardia, ABC and El Diario. The Integrative Cell and Tissue Dynamics group starts the year with good news from the European Research Council – they’ve been awarded both a new Consolidator Grant and a Proof of Concept award. The October cover of Current Opinion in Cell Biology (the reference opinion journal in cell biology, with impact factor 12) features research by IBEC’s Pere Roca and Xavier Trepat, who together with Raimon Sunyer from the UB have published a review paper in the issue, “Mechanical guidance of cell migration: lessons from chemotaxis”. The latest cover of Nature Materials was designed by IBEC PhD student Xavier Serra and shows a real tissue segmented computationally to give the impression of a Gaudinian trencadís. Integrative Cell and Tissue Dynamics group leader Xavier Trepat and his recent paper in Nature Cell Biology are the subject of an article in El Périodico today. A new discovery about how cells move inside the body may provide scientists with crucial information about disease mechanisms such as the spread of cancer or the constriction of airways caused by asthma. Researchers at IBEC and Harvard School of Public Health have found that epithelial cells—the type that form a barrier between the inside and the outside of the body, such as skin cells—move in a group, propelled by forces both from within and from nearby cells to fill any spaces they encounter. Monday’s news about the Nature Cell Biology paper ‘Chase-and-run between adjacent cell populations promotes directional collective migration’ was covered in several science and general news sites and magazines, including La Razón. Researchers at IBEC, the University of Barcelona and their collaborators have found that cells in our bodies, when moving collectively, carry out something similar to a game of ‘tag’ to coordinate their movement in a particular direction. Researchers have shed new light on how the cells in our bodies collectively migrate, a critical process in positive events such as embryonic development and wound healing, but which is also integral to the development of cancer. The Integrative Cell and Tissue Dynamics group’s recent paper published in PNAS was covered in Diario Medico. People can be brittle, transparent, shattered, or have a heart of glass. Now these attributes seem all the more appropriate following a discovery by researchers that migrating cells in our bodies behave in a remarkably similar way to glass when it is heated and cooled. An article by Dr. Xavier Trepat, senior researcher of IBEC´s Cellular and respiratory biomechanics group and the Department of Physiology Sciences of the University of Barcelona, contributes for the first time an experimental answer to the question of how cells move during biological processes as diverse as the development, metastasis, or regeneration of tissues. Summary: While in clinical settings, bone mineral density measured by computed tomography (CT) remains the key indicator for bone fracture risk, there is an ongoing quest for more engineering mechanics-based approaches for safety analyses of the skeleton. This calls for determination of suitable material properties from respective CT data, where the traditional approach consists of regression analyses between attenuation-related grey values and mechanical properties. We here present a physics-oriented approach, considering that elasticity and strength of bone tissue originate from the material microstructure and the mechanical properties of its elementary components. Firstly, we reconstruct the linear relation between the clinically accessible grey values making up a CT, and the X-ray attenuation coefficients quantifying the intensity losses from which the image is actually reconstructed. Therefore, we combine X-ray attenuation averaging at different length scales and over different tissues, with recently identified 'universal' composition characteristics of the latter. This gives access to both the normally non-disclosed X-ray energy employed in the CT-device and to in vivo patient-specific and location-specific bone composition variables, such as voxel-specific mass density, as well as collagen and mineral contents. The latter feed an experimentally validated multiscale elastoplastic model based on the hierarchical organization of bone. Corresponding elasticity maps across the organ enter a finite element simulation of a typical load case, and the resulting stress states are increased in a proportional fashion, so as to check the safety against ultimate material failure. In the young patient investigated, even normal physiological loading is probable to already imply plastic events associated with the hydrated mineral crystals in the bone ultrastructure, while the safety factor against failure is still as high as five. Abstract Coordinated cell movements in epithelial layers are essential for proper tissue morphogenesis and homeostasis. Microfabrication techniques have proven to be very useful for studies of collective cell migration in vitro. In this chapter, we briefly review the use of microfabricated substrates in providing new insights into collective cell behaviors. We first describe the development of micropatterned substrates to study the influence of geometrical constraints on cell migration and coordinated movements. Then, we present an alternative method based on microfabricated pillar substrates to create well-defined gaps within cell sheets and study gap closure. We also provide a discussion that presents possible pitfalls and sheds light onto the important parameters that allow the study of long-term cell culture on substrates of well-defined geometries. We resort to non-linear viscoelasticity to develop a truss element able to model reversible softening in lung epithelial tissues undergoing transient stretch. Such a Maxwell truss element is built by resorting to a three-noded element whose mid-node is kinematically constrained to remain on the line connecting the end-nodes. The whole mechanical system undergoes an additive decomposition of the strains along the truss direction where the total contribution of the mid-node is accounted for by using a null-space projection and static condensation techniques. Assembling of such line-elements in 3D networks allows us to model extended regions of living tissues as well as their anisotropies. The article provides a biomechanical analysis of ventral furrow formation in the Drosophila melanogaster embryo. Ventral furrow formation is the first large-scale morphogenetic movement in the fly embryo. It involves deformation of a uniform cellular monolayer formed following cellularisation, and has therefore long been used as a simple system in which to explore the role of mechanics in force generation. Here we use a quantitative framework to carry out a systematic perturbation analysis to determine the role of each of the active forces observed. The analysis confirms that ventral furrow invagination arises from a combination of apical constriction and apicalâ€“basal shortening forces in the mesoderm, together with a combination of ectodermal forces. We show that the mesodermal forces are crucial for invagination: the loss of apical constriction leads to a loss of the furrow, while the mesodermal radial shortening forces are the primary cause of the internalisation of the future mesoderm as the furrow rises. Ectodermal forces play a minor but significant role in furrow formation: without ectodermal forces the furrow is slower to form, does not close properly and has an aberrant morphology. Nevertheless, despite changes in the active mesodermal and ectodermal forces lead to changes in the timing and extent of furrow, invagination is eventually achieved in most cases, implying that the system is robust to perturbation and therefore over-determined.